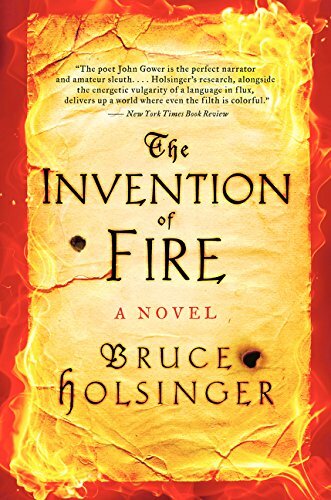 The Invention of Fire by Bruce Holsinger sets the gold standard for historical mysteries in the three most important elements of any novel: plot, characterization, and setting. Comparable to Umberto Eco’s The Name of the Rose in evoking a medieval setting, but with the plot centering on politics rather than religion, The Invention of Fire combines ambitious maneuvering, the greed for wealth and position, and the possibility of treason by members of King Richard II’s court with an investigation into a mass murder neither the high born or the lowly seem interested in seeing solved. Alan Pike is one of London’s gongfarmers responsible for keeping the city’s many streams clear of what the mayor’s men primly called “night soil.” Alan and the other gongfarmers called the muck and filth by more common names: “Dung and gong, fex and flux, turd and purge.” Flowing beneath two of London’s public privies, the stream is always clogged, often with rotten lumber or dead animals as well as human waste—it isn’t a dead animal that Alan finds. According to Ralph Strode, common serjeant from the Guildhall in London and a man of influence in the city’s government, who has called Gower to investigate the deaths, no one knows who any of the men are. The bodies were stripped naked before being dropped through the privy hole into the stream, so neither clothes nor other belongings remain that might identify them. “How can sixteen men die without being known, whether by name or occupation?” is Gower’s first question. What killed them is Gower’s next question. The manner of death according to Thomas Baker, a surgeon trained in Bologna, Italy, and knowledgeable in the ways of death, is that most of the men were killed by hand cannons, or handgonnes in the language of the time. Since firearms are weapons of war, the Tower of London and thus the king control such armaments, but the crown seems uninterested in the mass murder. “A London privy, London dung, a London burial, a London problem” is the court’s response. Although Gower knows that Michael de la Pole, Earl of Suffolk and Lord Chancellor of the realm, as well King Richard II, are worried about the upcoming parliament, he doesn’t understand why they should ignore mass murder. What puzzles Gower more than the response from the Court at Westminister is the reaction of Nicholas Brembre, Lord Mayor of London. According to Ralph Strode the mayor is not hampering the investigation, but forbidding an investigation at all. “He’s bribed off the coroner, discouraged the sheriffs from looking into things, and threatens anyone who mentions it.” Thus John Gower must search for a murderer or murderers without the mayor’s knowledge. The one lead that Gower has is one Peter Norris, once a respected and powerful mercer, now a debtor who is in and out gaol. Norris claims to know of a witness, although the mayor refuses to listen to his testimony. Brembre’s silence and the whispered rumors that he found evidence at the scene, but suppressed it, indicate to Gower that the mayor knows more than he is telling. But why would the Lord Mayor of London cover up mass murder? Chaucer’s warning about the ruthlessness of the murderers is proved by the murder of Piers Goodman, a hermit at Cripplegate, who gives Gower the name of a witness. Piers is burned alive in his cell. A further obstacle to Gower’s search of the truth is Peter Norris’s hanging before he reveals the name of the witness he saw. Gower’s search leads him to France where another mass murder is committed in a small village on market day. Again handgonnes were used. This time a witness, a young girl, survives the massacre and tells Gower of the coat of arms the assassins wore: the colors of the Duke of Gloucester. All trails are converging on the duke. The Invention of Fire by Bruce Holsinger is a literary novel that transcends the mystery genre, as it evokes a medieval London and a language in flux. Dr. Holsinger, a professor of Medieval Literature at the University of Virginia, translates his academic knowledge into a riveting tale of intrigue, murder, treason, and injustice that will appeal to readers who love both history and a literate mystery.